SMARTY is a low-cost mobile network, owned by Three, offering money back every month for your unused data. In the UK, SMARTY is a low-cost mobile network, offering SIM-only deals with coverage from Three. The network offers a choice of four data discount plans along with an unlimited data plan. 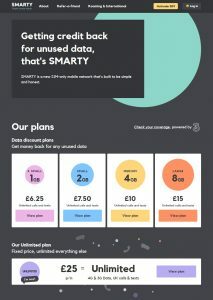 Most customers of SMARTY will choose one of the four data discount plans: Extra Small (1GB of data for £6.25/month), Small (2GB of data for £7.50), Medium (4GB for £10) or Large (8GB for £15). The plans come with unlimited calls and unlimited texts included, as well as a discount of £1.25 per GB for unused data. Customers wanting unlimited data can choose the £25 unlimited plan. In this article, we’ll review the SMARTY mobile network, starting with their line-up of 5 SIM-only plans. We’ll then compare SMARTY’s deals to rival mobile networks like giffgaff, before looking at the level of coverage you can expect and how to keep your existing phone number. SMARTY offers a choice of data discount and unlimited plans. If you choose one of the four data discount plans, the tariff is structured in such a way that you’ll pay a base fee of £5/month for unlimited calls and unlimited texts. On top of this, you’ll then pay a flat rate of £1.25 per gigabyte of data regardless of which plan you choose. 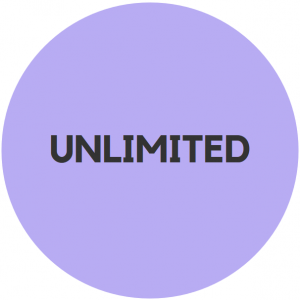 If you choose the unlimited data plan, you’ll pay £25 per month for unlimited minutes, unlimited texts and unlimited data. There are no additional charges for using too much data, but at the same time there are also no discounts available for unused data. There’s no need to undergo a credit check on SMARTY, as the plans work on a pre-paid basis. You’ll pay for your plan in advance using a registered credit card or debit card, with the top-up being converted automatically into a one-month plan. One of SMARTY’s unique features is the “unused data discount”. This gives you a cash discount on the following month’s plan based on data that remains unused at the end of your current month’s plan. This discount is offered at a rate of £1.25 per gigabyte, and means you’ll pay the exact same amount regardless of which plan you choose. On the Extra Small plan (1GB @ £6.25), you’d have to add a cash top-up to your account. You could then pay for an additional 0.6GB of data at £1.25 per gigabyte (costing 75p). The total cost for 1.6GB of data would therefore be £7 (£6.25 plus the additional 75p). Because of how this pricing structure works, it can often be advantageous to choose the largest plan. This is especially the case if you’re not sure how much data you need every month. Because of the unused data discount, you’ll only ever pay for what you actually use (but you’ll have more flexibility on how much data you can use on the larger plans). The unused data discount is calculated based on the number of megabytes you have remaining unused at the end of the month (1MB = 0.001GB). This means you’ll receive a discount for the exact amount of data you have left unused, rather than only in gigabyte increments. The unused data discount is only available on the Extra-Small, Small, Medium and Large data discount plans. If you’re on the unlimited data plan, you won’t be eligible to receive a data discount. As of February 2019, SMARTY says their customers have earned data discounts totalling £813,792. All of SMARTY’s plans include unlimited minutes, unlimited texts and an allowance of data that can be used in the UK and when travelling in Europe. The inclusive minutes can be used for calling UK landlines and mobiles (that’s most phone numbers beginning with 01, 02, 03 and 07). It’s not possible to use SMARTY on a purely Pay As You Go basis. You’ll need to maintain an active plan at all times for you to be able to make and receive phone calls. SMARTY’s £7.50 Small plan also compares fairly favourably to rival mobile networks. For a payment of just £7.50 per month, you’ll get unlimited minutes, unlimited texts and 2GB of internet. On rival mobile networks like giffgaff, you can get a fairly similar offering but without the inclusion of unlimited minutes and the unused data discount. For instance, giffgaff has a £7.50 goodybag with 250 minutes, unlimited texts and 2GB of data (giffgaff’s coverage comes from O2 rather than Three). SMARTY’s £10 Medium plan comes with unlimited minutes, unlimited texts and 4GB of internet. Other mobile networks may sometimes offer more data at this price point, but it can vary depending on time-limited promotions. SMARTY’s £15 Large plan comes with unlimited minutes, unlimited texts and 8GB of internet. At this price point, it’s often possible to get better deals on other mobile networks, but this may require you to sign up to a 12-month contract. The unused data discount is also exclusive to SMARTY, and isn’t available on plans from other networks. One notable alternative is giffgaff’s £15 goodybag (also available on a 30-day rolling basis). For £15 per month, giffgaff will give you unlimited minutes, unlimited texts and 8GB of internet. Once you’ve been a customer of giffgaff for 3 months, an extra 1GB will be added to your allowance each month. This will give you a 9GB monthly allowance. 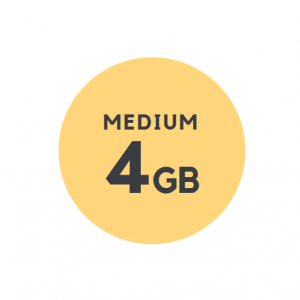 giffgaff’s Always-On data plan only offers 4G download speeds on the first 20GB per month. Meanwhile, Virgin’s unlimited data plan is exclusive to customers who have Virgin TV or home broadband. See our full comparison of unlimited data plans for a more in-depth comparison. You can also see our full listing of SIM-only deals available in the UK. SMARTY is a SIM-only mobile network, so you’ll need to provide your own unlocked handset to use with the service. You can use any compatible 3G or 4G smartphone, including your existing phone or one that you’ve purchased SIM-free. If you’re planning to use your existing smartphone, it might be necessary for you to first unlock it before using it on SMARTY. For more information, see our guides to unlocking an iPhone and unlocking a Samsung Galaxy smartphone. 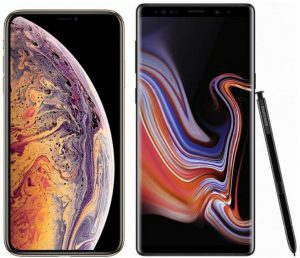 If you’re buying a new unlocked smartphone, there are a number of retailers where you can easily buy a SIM-free smartphone. Our current recommendation for a mid-range and affordably priced handset is the Moto G which is available from around £120 unlocked. SMARTY offers 99.8% population coverage on 4G. SMARTY is a low-cost sub-brand of Three. As Three provides all of the underlying coverage for SMARTY, customers will receive the exact same coverage as they would on Three. Like Three, and like all other mobile networks using coverage from Three, SMARTY doesn’t provide any 2G coverage. This means a SMARTY SIM card will not work in a 2G-only handset. You may also have limited functionality when using a SMARTY SIM card in some dual-SIM smartphones. 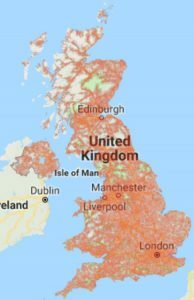 For more information about coverage on different mobile networks, please see our in-depth guide to mobile phone coverage in the UK. Wi-Fi Calling and 4G Calling are not currently available to customer to SMARTY. 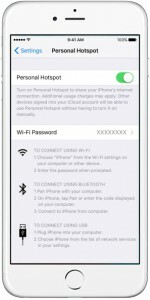 Tethering or personal hotspot refers to the process of sharing your smartphone’s internet connection with other devices (e.g. with a laptop or tablet). 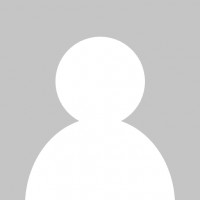 It’s useful for getting a mobile broadband connection on other devices whilst you’re on-the-go: for instance, sending e-mails from your laptop or watching YouTube videos on your tablet. You’re entitled to use your data however you like, no matter which of the 3 SMARTY plans you’re on. So you can tether and use your phone as a mobile hotspot with your full allowance if you want to. The only exception to this is the Unlimited plan and if you’re roaming, where you’ll be limited to 19GB. On SMARTY, it’s possible to use your mobile phone abroad through the international roaming service. Within Europe, you can use your SMARTY plan allowances at no extra cost (up to 19GB of data per month if you’re on the Unlimited data plan). Outside of Europe, you’ll need to top-up your account with a cash add-on. You’ll then pay SMARTY’s international roaming rates. Between September 2017 and July 2018, international roaming was not available to customers on SMARTY. 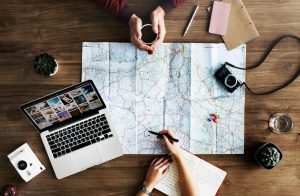 If you joined SMARTY prior to July 2018, you’ll need to make a change to your mobile phone settings to use your SIM card abroad. If you’d like to keep your existing phone number when moving to SMARTY, it’s a straightforward process to transfer it from your old mobile network. To do so, start off by ordering a SIM card from SMARTY. It will come with a temporary phone number, allowing you to test out the service before moving your phone number over. Once you’ve done this, you should request a PAC Code from your old mobile network. This should be provided to you free of charge within 2 hours of your request. 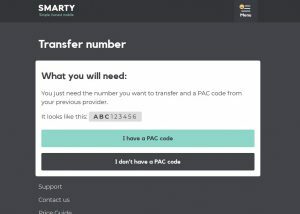 When your SMARTY SIM card arrives in the post, and once you’ve had a chance to make sure everything’s working correctly, you should provide your PAC Code to SMARTY through your online account dashboard. SMARTY will then schedule the transfer of your phone number, normally within 2 working days. 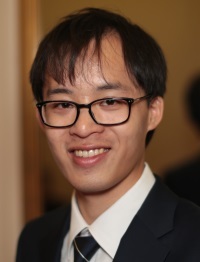 For more information, please see SMARTY’s official website. Do i have to pay a £5 service charge each month regardless of unused data? Yes, you’ll need to pay the £5/month service charge regardless of whether you actually use the SIM card. The £5/month charge gives you unlimited calls & texts (and pays for the running of the network, according to SMARTY). A) can the sim be used in a mi-fi modem. B) Is there a cap on the amount of internet data useage when abroad. a) Yes, it’s possible to use your SMARTY SIM card in a Mi-Fi router. This is confirmed here on the SMARTY website. b) There’s a fair usage limit of 19GB per month when travelling abroad in Europe. If the balance of your time is spent abroad outside the UK, SMARTY may also decide to start charging for your usage. Best network I’ve ever used! Good coverage and REALLY fast download speed! I’m on the 4GB plan only paying about £10/month! * Customer service was great online and numbers transferred with 24 hrs.